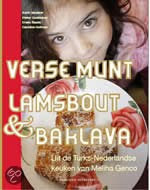 Today I'd like to write about a book written on Turkish food by Karin Vaneker (with Pieter Ouddeken and Erwin Slaats). It's called "Verse Munt Lamsbout & Baklava". Karin Vaneker is a Dutch artist and culinary journalist. She interviewed Meliha Genco, a Turkish mother living in Amsterdam with her family. Meliha is originally from Gaziantep so many of the recipes in the book are from that region (Eastern Mediterranean). In the book you'll read the family's trip from Gaziantep to Amsterdam, a general article on Turkish cuisine, the ingredients that are used in Turkish cuisine. Recipe section starts with breads and pastries. Here you'll see corn bread, "lahmacun" a flat bread with a meat topping, "zeytinli borek", savory pastry with an olive filling and some other pastries. Soups include green and red lentil soups, yogurt soup, mung bean soup and bulgur soup, mostly from Gaziantep region. Rice dishes are called "pilav" in Turkish, so does similar bulgur dishes. In this section, you can see bulgur pilav with vermicelli, bulgur pilav with lentils, pilav with meat and spices. "Kofte" which means meatballs in Turkish are a special section. "Tartaarkofte", grilled kofte, lentil kofte are few. In the book you'll see varieties of pickles, Turkish sweets, kebaps, salads, vegetable and meat dishes all made by Meliha and her family. I especially love the photos. When you look at them, you see that they're made by and for the family. You see family members, ingredients, the process of making some of the dishes. I wish I could read it. I sincerely hope this book will be translated in many languages. Thank you for this enormous effort and putting together a beautiful book. I believe this book will show Dutch readers that Turkish cuisine is much broader and deeper than kebap and lahmacun!